Back in 2013, Nicholas Smith asked me to join a group of other writers in producing some catalog text for a series of sculptures by Roland Persson, to be exhibited at Örebro Konsthall in Stockholm as The phenomenon of materializing a dream. “Precipitation” is the piece I ultimately wrote. So here I was, with the daunting task of writing about an exhibit that was “about” everything that cannot be experienced from a far distance— tactility, aroma. It seemed to me that Persson’s exhibit would require the visitor’s nodal body to act self-consciously as the site of encounter with the sculpture. In this exhibit, what is familiar to the eye would also undeniably be understood as something else to the hand and foot. 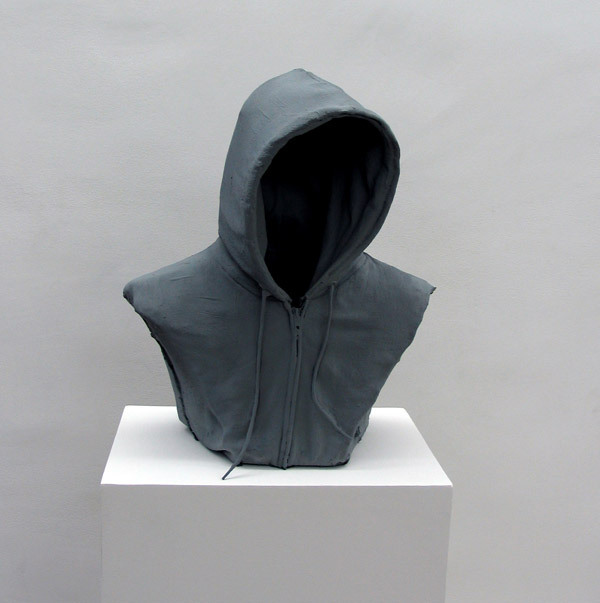 Mark Jenkins, “Hoodie Bust,” 2013. Is there a way to operationalize the “whether false or true”? And what would it mean to nonetheless embrace remediation as an act that denies origin while insisting on the new object’s own analog integrity ⇢ medium frames sensation: am I a dream’s media? And what would it mean to be cut off from that signal, or to plug into it? Thinking about that still gives me a headache, especially if there may be no there there, and thus even less to stand in the face of our world’s continual sorrows. We need to be dreamed.